I’m so excited to be part of the Mimi’s Adventure in Baking Blog Hop. Alyssa, the author, is her sharing with you a fabulous recipe for Chocolate Mascarpone Mousse Cups, a little about her and her book. This sounds like a lay-up right? Chocolate is almost everyone’s best friend so it would be pretty hard not to win over your picky eaters with chocolate am I right? As a pastry chef in New York City I have always been surrounded by upscale desserts. After writing my children’s picture book cookbook I started really thinking about all of my recipes, and which ones are kid approved. I realized then that a lot of them were mom approved too! Which brings me to my next point… we put so much time into the meal whether we are cooking for our family or guests but what about dessert? Now don’t get me wrong I am thrilled with a store bought apple pie sometimes and please don’t get me started on carvel cakes. I am a sucker for ice cream cake. But what about if I told you that you can make a restaurant style dessert in less than 30 minutes. (That’s a fact believe it or not. I timed myself and others doing it.) This fun dessert is a go to for any busy mom, entertainer, or really any dessert lover. This quick mousse in a chocolate cup will not only impress your guests, but will peak your children’s interest in this edible craft! The first thing we are going to do is blow up one balloon for every guest. I would say blow up a couple extra just in case you have a mini catastrophe. In a microwave safe bowl begin to melt your chocolate melts. These are much better to use for the home cook because they will set nice and quickly for you. I like to melt a couple different chocolates to make my cups a little more eye appealing. And let’s be honest, if a cup has two type of chocolate in it you would be impressed! So let’s melt our chocolates. You must stir every 30 seconds or so. This chocolate can burn easily so be sure to watch it in the microwave. Once all of the chocolate is melted in two different bowls it’s time to start dipping! This is the fun part for the kids so feel free to pull them in for the fun or keep it all to yourself. Your choice don’t worry no judgment here! 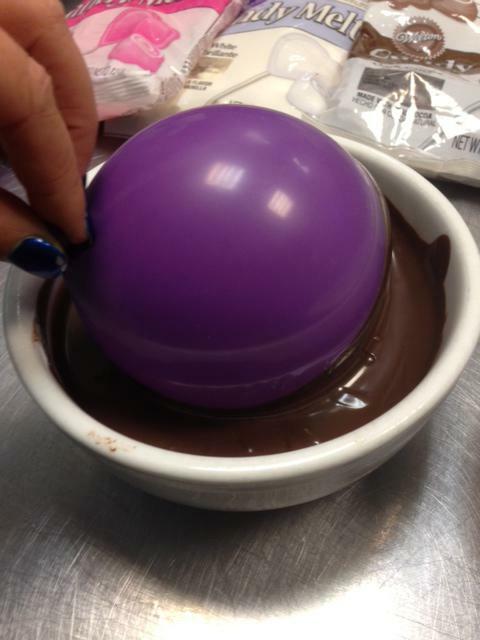 Alternate dipping parts of your balloon to mix and spread the chocolate. Once you have fully dipped around the bottom half of the balloon hold it standing up on a cookie sheet with parchment paper. I like to hold it for a couple seconds until the chocolate starts to set and can stand on its own. Continue with the rest of your balloons. And feel free to swirl the chocolate! Once all of your balloons are dipped and on your tray, set them in the refrigerator to cool or in a cool room is fine. They don’t have to go in the fridge if you do not have space. They will set, it may take slightly longer though. Now While our cups are cooling onto the easiest mousse you will ever make! In your mixer place you powdered sugar, mascarpone cheese, heavy cream, vanilla and cinnamon. Place on low speed to break up the marscapone. 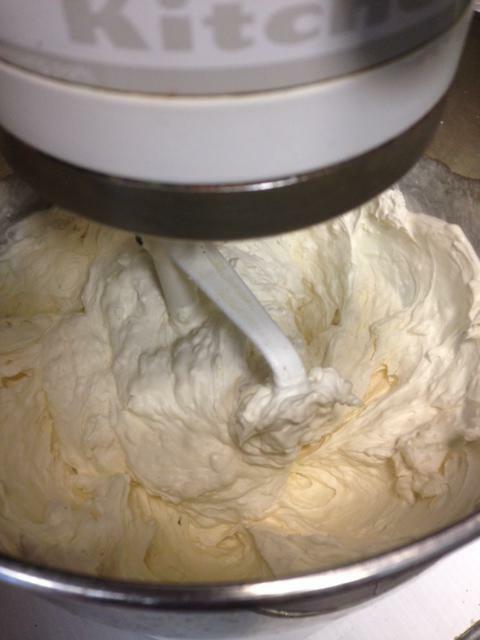 Slightly increase the speed and let mix until it becomes thick and airy. The whisk attachment is key here. The whisk is what is going to incorporate the air into your mousse so be sure to use that attachment. Two minutes later… Voila! Mousse! You made mousse! Like seriously? How easy was that? Also if this is for an adults only party feel free to add a shot of your favorite liquor. Some of mine that I like to use in there is Frangelico, Kahlua, Baileys… or all three. Or maybe some fresh lemon zest that would be a great addition to the nonalcoholic version with vanilla and cinnamon. The possibilities are endless but do not find that intimidating this is the fun part where you get to make it your own! Party on! Now that your mousse is ready and your chocolate is set time to pop those balloons. I like to keep them in a cool room to ensure they are nice and hard. Take a knife to the balloon and gently pop it. After popped gently peel off the balloon from the inside of the chocolate cup. That’s it folks! 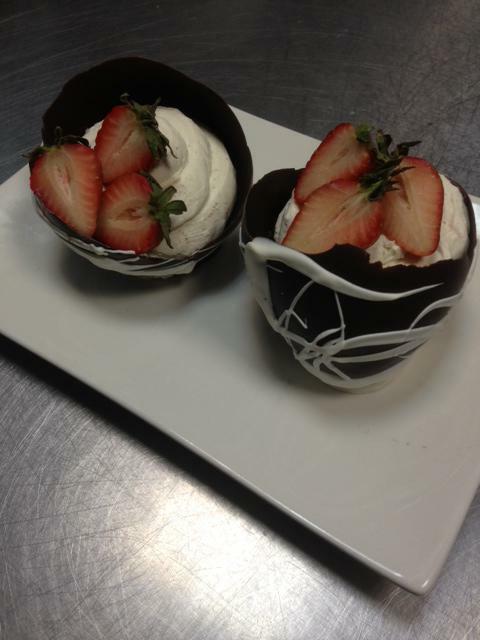 You have officially made edible chocolate cups! And no worries if they don’t all look the same that’s the beauty of them. Okay Finishing touches time! Lets take your berries and toss them in a tablespoon or two of sugar just to give them a nice touch. If you have lime, feel free to zest some lime over them as well. Citrus always enhances flavors. I like to give a couple spoonfuls into our nice cold chocolate cups filling it ¾ of the way up. Once filled top with a heaping spoonful of your marinated berries and serve! That’s it! If you are not serving them right away I would say fill your cups with the mousse and wait until right before you serve them to top with berries. This fun dessert will impress friends, or hopefully amaze your children. I like finding foods that kids can get into and enjoy doing. Using your brain in a way that you don’t do on a regular basis is key to keeping you creative and open minded. Have fun with your food, it should be an expression of your mood. Desserts are truly made with love and this one is a delight for any loved one. I hope you all enjoy this fun and different dessert! Thanks for reading and if you have any little one my new children’s picturebook cookbook is a must for any child that loves getting their hands dirty in the kitchen! Mimi’s Adventures in Baking is filled with fun scratch baking projects you can enjoy with your kids. Happy reading and happy baking! Mimi’s Adventures in Baking is the first storybook cookbook that creates a fun and interactive way of learning how to bake. Follow Mimi as she learns to measure, mix and bake her way to her very first batch of homemade chocolate chip cookies. Learning how to bake can be easy and fun with Mimi! Navigating your way through a kitchen full of tools, ingredients and of course safety measures are brought to life in this storybook cookbook. No more flipping through endless recipes and boring procedures. Mimi makes baking fun for the whole family. Let your child take control and become the chef they always wanted to be! 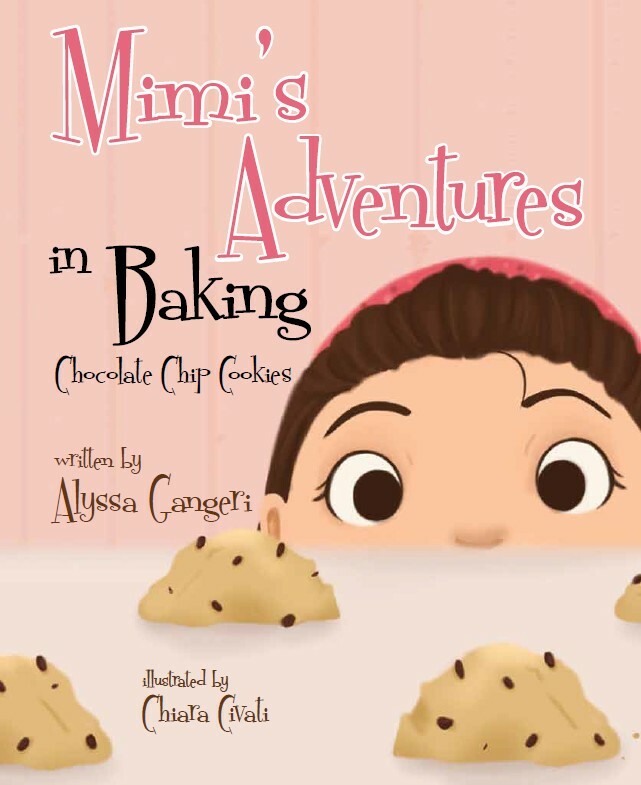 Mimi’s Adventures in Baking Chocolate Chip Cookies releases in March 2015! 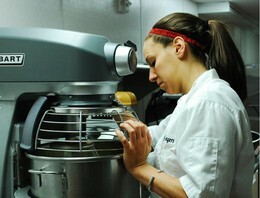 Chef Alyssa has been baking since she was a little girl in her grandmother’s kitchen. Since graduating from the Culinary Institute of America she has worked for famous chefs and elite companies such as the Ritz Carlton, Tom Colicchio, Norman Van Aken and Gray Kunz. She currently is the Executive Chef at Riverwalk Bar and Grill on the Historic nook of New York City, Roosevelt Island. She also has a boutique custom cake company called AllyCakesNYC where she creates cakes to appease the imagination. Through her journey of baking she developed Mimi, her very own miniature version of herself. Thank you so much Alyssa! I can’t wait to go through this book with my son. Wow! These look so amazing and so beautiful! Thanks for linking to Tips & Tricks this week. I can’t wait to see what you link up next week. I pinned this to our Tips & Tricks recipe board.